Anyone who’s ever experienced a door frame (or a door itself) being impacted knows the hassle that brings. It can cause you to be unable to operate the door until repairs can be made, which are costly and can crimp operations for hours, or longer. There are a several ways to go when it comes to protecting your doors, and the best way depends on your door setup, the kind of door you have, and the space around your door. 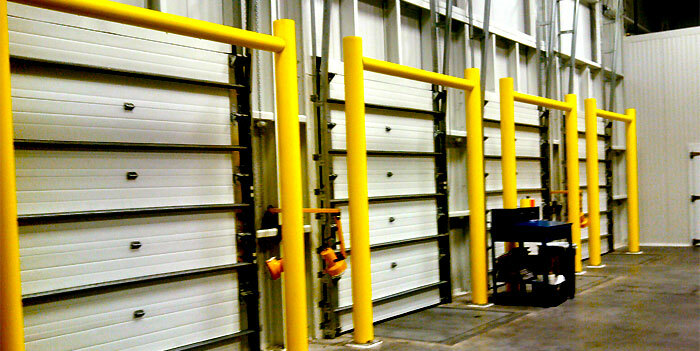 For tight spaces, overhead door track protectors are ideal. They shield either 2′ or 3′ of the door track at the base – which is the most frequently-forklift-impacted part of a dock door. People backing lift trucks up hit them all the time. Even a relatively minor impact from a walkie or stacker (and a sufficiently loaded, moving pallet jack) can damage a door frame. Easily the most economical way, door tracks can cost about $100 a pair (give or take). They don’t take any space up around the door frame either, so if space for package stacking or a shop desk is needed they leave you plenty of area for that. More inclusive and protective are “Goal Post” Dock Door Guards. They enclose the entirety of a dock door. 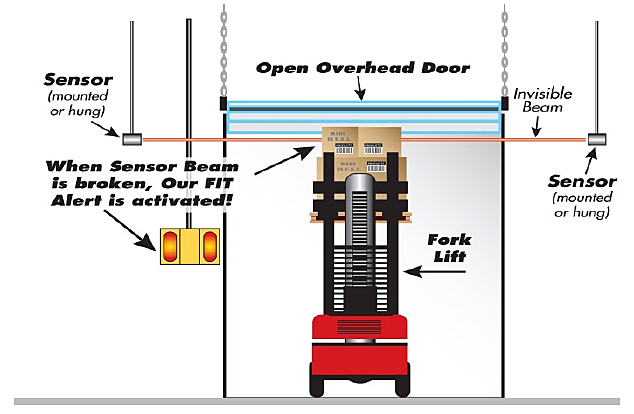 If you have an expensive high speed door apparatus, and people are driving lift trucks with forks up into or out of the door (like they can do in a freezer, shipping, or internal door application) this system protects the entire height of the tracks, but also any apparatus above the door. 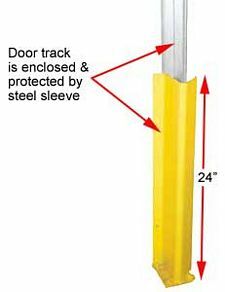 They’re more expensive than simple track guards (by a good bit) but they can help you protect almost any kind of opening, including the walls around a door, from forklift damage. Since they can be customized to extend to the left or right of a door, they can even protect control panels or other equipment on any side of the door. There are a couple of options here. First, overhead collision sensors. These can be set to monitor and protect overhead doors, sprinkler systems, conduit and other ceiling obstacles near a door. They sense a potential collision and flash to alert the driver. Their sensors can be set up for various widths and can cover a range of overhead obstructions. You can also use low clearance warning bars to protect your scrolling door mechanisms, doors, and frames. These can be hung near the door to warn forklifts with extended loads that they may cause a collision. Powered units can provide a flashing alert to heighten awareness. When a forklift hits the bar, a loud siren and flashing lights activate to help alert the driver of an impending accident. Between door frames, steel guardrails are ideal. Installed between doors, but covering the base of a track, they shield the base about as well as track protectors. They completely occupy that space, but also can be offset to allow stacking or other functions on the wall areas between doors. They are more expensive than track guards, but offer extended protection to walls between door bays.